In a large bowl or your electric mixer, beat the eggs till frothy. Add the sugar and salt and beat again. Gradually add the flour while still beating, to avoid lumps. Add melted butter and mix. Lastly, stir in the milk. Butter a baking dish (shallow preferably, but casserole type will do). 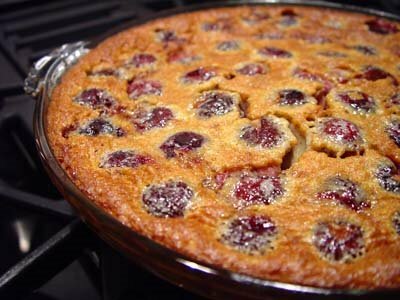 Pour in cherries, then pour batter over fruit. Bake at 190 C/375 F for 45 minutes. Upon removing from oven, sprinkle cinnamon sugar over top. Serve lukewarm if possible.